Blow on over to the windy city to see Wexler Packaging Products exhibit at PRINT ‘18 from September 30th through October 2nd. Ring in the new month with us at McCormick Place in Chicago, IL as we showcase some of our most innovative machinery. We’ll be at booth #324 waiting to welcome you to the world of cutting-edge technologies. One gem you’ll get to see live in-action at PRINT is the ATS US-2000 LBM. The LBM automatically bands stacks of product one row at a time off the cutter. With easy format change, auto-measuring of band length and positioning, and zero-damage edge protection, stacks shouldn’t be bundled any other way! You’ll also run into a few of our sleek stand-alone machines including the US-2000 AD 360×260, the US-2000 AD 900×500, the US-2000 LD1 and the ATS MSX 420 – the newest version of our heat seal series. These machines can operate with a wide range of materials including white paper, brown paper and clear films along with custom printed materials and the ability to print on-demand. Come visit us to see why banding is the answer. The event calendar this year includes dozens of seminars with topics such as Eight Imperatives for Growing Your Printing Business, Marketing to the Generations, The Future of Paper & Print, and so much more. PRINT ’18 will not only be filled with 300+ exhibitors but will also be three days packed with inspiring sessions with industry trendsetters.  Wexler Packaging Products is eager to see our guests and answer all their questions. Click here to register with our VIP comp code today!